Green Bay Packers wide receiver Randall Cobb was outfitted with a GoPro camera mounted on his head during Sunday’s Jordy Nelson Charity Softball Game in Grand Chute. See the game from his point of view and listen to what he was saying to his teammates. Packers WR Randall Cobb made an appearance this week on the Dave Dameshek podcast to talk about the state of the Green Bay Packers, catching the division-winning TD pass against the Bears in the regular season finale, and where he ranks Aaron Rodgers among the NFL’s best quarterbacks. Packers QB Aaron Rodgers’ 48-yard TD pass to WR Randall Cobb on fourth-and-8 in the final minute of the Week 17 showdown at Soldier Field won the online voting for the NFL’s Never Say Never Moment of the Year. The award was announced on Saturday night at the third annual “NFL Honors” show in New York City. The touchdown, with 38 seconds left in the game, gave the Packers a 33-28 victory over the Bears for their third straight NFC North title. The division crown and an NFC playoff spot were on the line in the game. The Packers trailed, 28-27, when they took possession on their own 13-yard line with 6:24 left. Converting a pair of fourth downs on a short run by FB John Kuhn and a pass to WR Jordy Nelson, the Packers faced another fourth down at the Chicago 48-yard line. Rodgers, playing in his first game back from a broken collarbone that sidelined him for seven contests, and Cobb, also in his first game back from a leg injury that cost him 10 games, hooked up for the game-winner. The Bears brought a blitz, Kuhn threw a key block on Chicago DE Julius Peppers that allowed Rodgers to get out of the pocket, and Cobb was running free down the field waving his hand. Rodgers’ pass settled into his arms at the 10-yard line and he dove over the goal line, setting off a wild celebration on the field and on the Packers sideline. 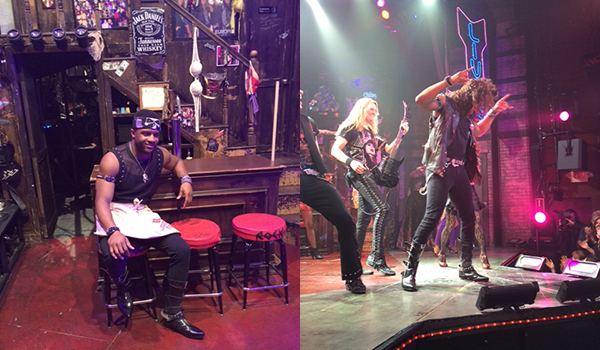 Packers WR Randall Cobb made his Broadway debut last night, walking onto the stage during a performance of “Rock of Ages” and making the most of it. Here are a couple of photos, courtesy of the NFL. 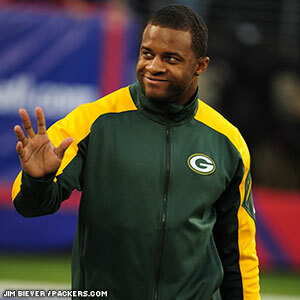 Packers WR Randall Cobb and former Packers RB Ahman Green are among the NFL players who will make their Broadway stage debut this week amidst New York City’s Super Bowl activities. The show Rock of Ages will feature different NFL stars in different showings, with Cobb slated to appear on Tuesday and Green on Saturday. Packers QB Aaron Rodgers’ 48-yard TD pass to WR Randall Cobb on fourth down with 38 seconds left in Chicago is one of the finalists for the NFL’s Never Say Never Moment of the Year. The play was just voted the winner of the Never Say Never Moment of the Week for Week 17. Voting will be open through Thursday, Jan. 23. Vote by clicking here. The winner will be announced at the third annual “NFL Honors” show, a two-hour prime-time special on FOX on Feb. 1, the night before Super Bowl XLVIII. Peyton Manning helped the Denver Broncos overcome a 14-0 deficit in the first quarter, and again by a touchdown in the fourth quarter, to earn a thrilling 51-48 win on the road against the Dallas Cowboys in Week 5. In the game, Manning threw four touchdown passes, two to wide receiver Julius Thomas, and added another on a run. During the record-setting game, the Broncos and Cowboys combined for 1,039 yards of total offense which is tied for the second-highest scoring game since the NFL-AFL merger in 1970. Linebacker Danny Trevathan’s interception of a Tony Romo pass set up Matt Prater’s game-winning field goal and assured that the Broncos would remain unbeaten. Cam Newton and the Carolina Panthers survived a defensive struggle in San Francisco to collect their fifth consecutive win. The Panthers rallied from nine down to earn a huge 10-9 road win against the San Francisco 49ers. Running back DeAngelo Williams’ touchdown brought Carolina to within 9-7 of San Francisco, and Graham Gano’s 53-yard field goal in the fourth quarter put the Panthers ahead. However, it was the stingy Panthers defense led by linebacker Luke Kuechly, who finished the game with 11 tackles and a sack, that made sure the narrow one-point lead held up. The Panthers twice shut down Colin Kaepernick on last-ditch, late-game drives, including an interception from Drayton Florence to seal the win. Down 24-0 at halftime, quarterback Tom Brady guided a second-half comeback that forced overtime, where the New England Patriots eventually won, 34-31. The Patriots lost fumbles on their first three possessions as the Broncos built a 24-0 lead in the first half. However, the Patriots rallied, scoring on their first five possessions of the second half to erase the deficit. After Broncos quarterback Peyton Manning threw a touchdown pass to receiver Demaryius Thomas late in the fourth quarter to tie the score and ultimately force overtime, the Patriots took advantage of a fortunate bounce of a punt that hit a Broncos player and was recovered by Nate Ebner at the Broncos’ 13-yard line. Kicker Stephen Gostkowski kicked a 31-yard field goal to give the Patriots a 34-31 overtime win. Quarterback Joe Flacco threw a touchdown pass to rookie receiver Marlon Brown with four seconds left to cap a frenzied final two minutes and lift the Baltimore Ravens to a thrilling 29-26 win over the Minnesota Vikings. Despite playing in a snowstorm, the Ravens and Vikings combined for five touchdowns in the game’s final 125 seconds. The Flacco-to-Brown score finished a five-play, 80-yard drive that eclipsed all but four of the game’s final 45 seconds. The Ravens’ rally also included a 77-yard kickoff return for a touchdown by Jacoby Jones. Facing a fourth-and-8 at the Chicago Bears’ 48-yard line with 38 seconds remaining, Green Bay Packers quarterback Aaron Rodgers hit receiver Randall Cobb for a 48-yard touchdown play that helped the Packers capture the NFC North crown. Rodgers had missed seven games with a broken collarbone and Cobb had missed the previous 10 games with a knee injury.